Firefighters have put out a blaze that broke out in a section of aircraft carrier being constructed at Rosyth, in Fife. It is understood a piece of welding equipment caught fire on board the UK's first Queen Elizabeth class carrier. About 40 firefighters were sent to tackle the blaze, which broke out in a stairwell just after 14:30. The vessel will be the first of two Queen Elizabeth class carriers commissioned for the Royal Navy. Fife Constabulary said no-one was injured in the fire, which was traced to an extractor fan. The fire was limited to a compartment on deck eight of the 8,000 tonne middle section of the hull. The section is in dry dock number one at the Rosyth construction yard. When completed, the 280m (919ft) HMS Queen Elizabeth will be capable of deploying up to 40 Lockheed Martin F-35 aircraft. 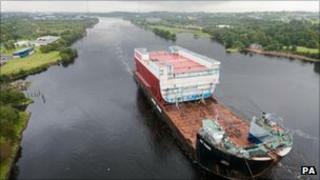 The ship will not be finished until 2016 at the earliest, and may not be ready for active service until 2020. The carrier project is one of the largest defence orders placed in the UK, with a price tag of £5bn. Rosyth dockyard operator Babcock confirmed employees were now back working as normal and said the fire had had "no consequences" on operations.